“The angels brought this card to you because of your heightened sensitivity to energies. This sensitivity means that you may inadvertently absorb other people’s energies, which may make you feel tired, unfocused , or upset. Just as you would not walk outdoors in a rainstorm without an umbrella, it’s important to use an energy umbrella in the face of any emotional downpour. If you feel negative energy – or people are arguing, competing, or using frightening words – it is vital for you to shield yourself. This means imagining that a bubble of protective light surrounds your entire body. 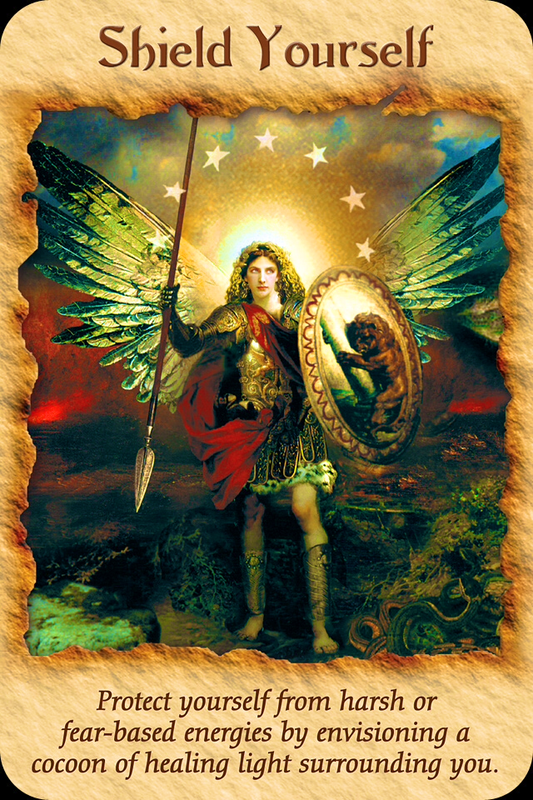 You can also ask Archangel Michael to guard you from lower energies, and you can even “borrow” his shield as a protective buffer. Green: Healing and protection of health. Again we have synchronicity, as a day or two ago we talked about Cutting Cords with Archangel Michael, which should always be done before shielding. I have mentioned before that my all time favourite shield, (which is a free download!) is by Mashur Anam at Life Harmonized, called the Harmonic Shield. It has helped me to strengthen my shielding. I use the Harmonic Shield in conjunction with shielding with Archangel Michael, as I am a very empathetic person and I have to be very careful that I don’t sponge up everyone else’s energies throughout the day! Before I learned about cutting cords and shielding, any time spend around negative, stressed out, sad or angry people left me completely overwhelmed as I took on all of their low vibrational energy; in fact, often they felt much better and I was a mess for hours or days! This is such a valuable tool for those of you who find that you have this issue, please download the Harmonic Shield right now, listen to the MP3 asap and activate the shield at least once daily, you will notice a huge difference in your inner peace, I sure do! I have also been talking about crystals lately, and their importance in healing and protection. Crystals can greatly enhance your protective shield and some of the best, (although you should choose the stone that resonates with you), are Shungite, black tourmaline, obsidian, smokey quartz, amethyst, and in matters of the heart, rose quartz. There are many more of course, and when choosing a stone I always suggest using your intuition first, and your research second! All of these stones can be worn or carried on a daily basis, and if you do come into contact with some really harsh energy, or if you are particularly sad or stressed, they should be cleansed regularly of any absorbed low vibrational energy. I like to use a tuning fork or my Tibetan Singing Bowl for clearing my crystals, using sound waves which are powerful and will reset the stones immediately to their natural healing vibrational frequencies, that way I’m not losing any precious time with them. Some other methods include placing the crystal in a plant or garden for the night, placing them under a full moon (which I highly suggest you do monthly to recharge them), or, depending on the crystal as many don’t like water or sunlight, you may be able to cleanse them in a window or in water or salt water (please check which crystals don’t like water, such as selenite, and ones that don’t like sun, such as amethyst and smoky quartz!). Any salt based crystals such as selenite or halite will literally melt away in water, and amethyst or smokey quartz will permanently fade in the sun! Cutting cords should be done every evening, or after every encounter with negativity; shielding can be done right after and redone first thing in the morning, which is as easy as saying, either out loud or to yourself: “Activate the Harmonic Shield” or “Thank You, Archangel Michael for shielding me today and every day from any and all low vibrational energy, surrounding me with love and light, ” while visualizing a beautiful and colourful eggshell of light covering you completely, connecting to your chakras and filling you with bright white love and light. Or both, that’s what I do!